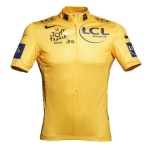 The Tour de France has 4 jerseys on offer for the various competitions that take place within the race. The most prestigious jersey is the yellow jersey of GC leader, which unfortunately has been tainted on a few occasions since the turn of the century (see table below). The green jersey is the points classification sought after by sprinters and classics men. The polka dot jersey recognizes the rider who obtains the most mountain points, while the white jersey is a GC for riders under 26. * Initially Alberto Contador was the winner. He had to give back his title after charges of doping. ** Lance Armstrong’s victories (1999 t/m 2005) have been taken from him due to the use of doping. No new winner was declared. Four riders remain in the record books for having won the Tour de France five times: Eddy Merckx, Bernhard Hinault, Miguel Indurain and Jacques Anquetil . Anquetil pulled off the unthinkable in 1961 when he held the yellow jersey from the first day of the race right up until the end. Erik Zabels hold the record for green jersey wins with 6 – he may come under pressure from Peter Sagan in the coming years. The young Slovak already has 5 from 5 attempts. Richard Virenque is the King of the Mountains in the Tour de France. He won the polka dot jersey 4 times in a row from 1994-1997, and added a further three jerseys in 1999, 2003 and 2004. Andy Schleck and Jan Ullrich both won the white jersey 3 times and share the record. In 1969, Eddy Merckx won the yellow jersey, the green jersey and the polka dot jersey, the only man ever to do so in a single Tour de France. He also has the most stage wins with 34. Mark Cavendish powered to a stage win on 30 occasions. The youngest winner ever was Henri Cornet, winning the 1904 Tour at 19 years of age. The oldest winner is Firmin Lambot, who was 36 years when he won in 1922. Cadel Evans is the oldest winner post WWII – in 2011 he was 34 when he finally won his yellow jersey after years of trying.